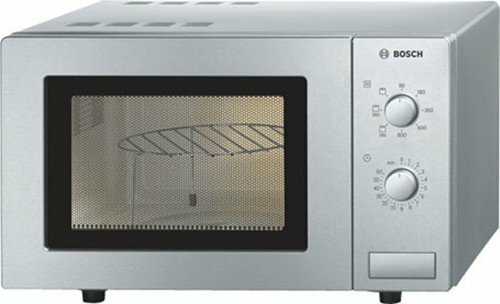 The Bosch HMT72G450B is a compact 17 litre capacity microwave, offering 800w of power and a grill facility. Deecent build quality, works well, looks good Small capacity, only 600w when cooking food. Overall build quality of the HMT72G450B is very good, as you'd expect from a manufacturer such as Bosch. Finished in a brushed stainless steel finish, it doesn't feature an LED digital display, and is controlled by 2 dials. The upper dial sets the temperature or mode, and the lower dial is used to set the time period. 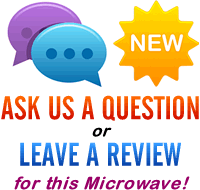 A simple button is featured below to start the microwave. Overall the controls are pretty well labelled, and the absence of multiple buttons make it easy to use. On the downside, it is pretty small - just 17 litre capacity, and only offers 800w when in microwave mode. It's also a bit limited in defrost facilities - with no obvious set modes for certain food types. Another slight quibble is that although this silver microwave oven is advertised with an 800w power output, it recommends that this mode is only used for liquids - overall power for food is a maximum of 600w - bear this in mind. Overall it looks good, is very easy to operate, and is very well built, but may be a touch too small for some users. A well built and very compact microwave. Slightly lacking in features and size, but very easy to use.